Why share food with non-family members when there is no immediate gain? 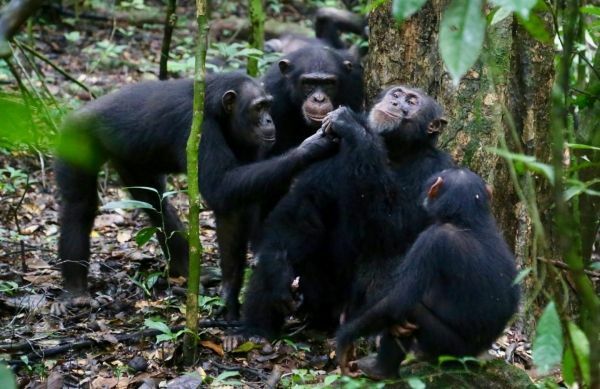 An international team of researchers from the Max Planck Institute for Evolutionary Anthropology (MPI-EVA) in Leipzig, Germany, conducted observations of natural food sharing behavior of the chimpanzees of the Taï National Park, Ivory Coast. They found that chimpanzees who possess large, desirable food items, like meat, honey or large fruit share food with their friends, and that neither high dominance status nor harassment by beggars influenced possessors’ decisions to share. Sharing meat after hunting and exchanging other valued food items is considered key in the evolution of cooperation in human societies. One prominent idea is that humans share valuable foods to gain future favors, such that those we chose to share with are more likely to cooperate with us in the future. Despite regularly occurring in humans, sharing food outside of kinship or mating relationships is rare in non-human animals. Our two closest living relatives, chimpanzees and bonobos, are two of the rare exceptions, and because of the important role of food sharing in human evolution, examining the sharing patterns of chimpanzees can help to answer questions on how sharing food amongst adults evolved and how it may have shaped human cooperation.